Citico Creek & Joyce Kilmer Wildernesses - Take a Hike! 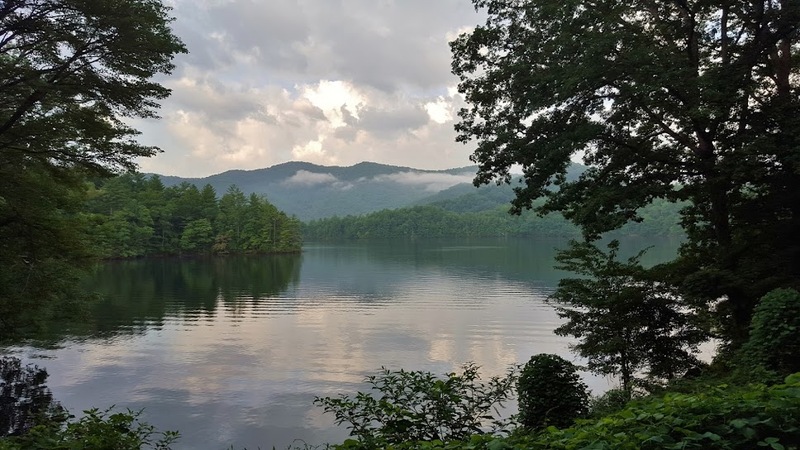 This past weekend, we headed to the Lake Santeetlah area in far western NC and eastern Tennessee for some wilderness hiking. We left Friday after work and drove out to the Robbinsville area, arriving shortly before sunset. 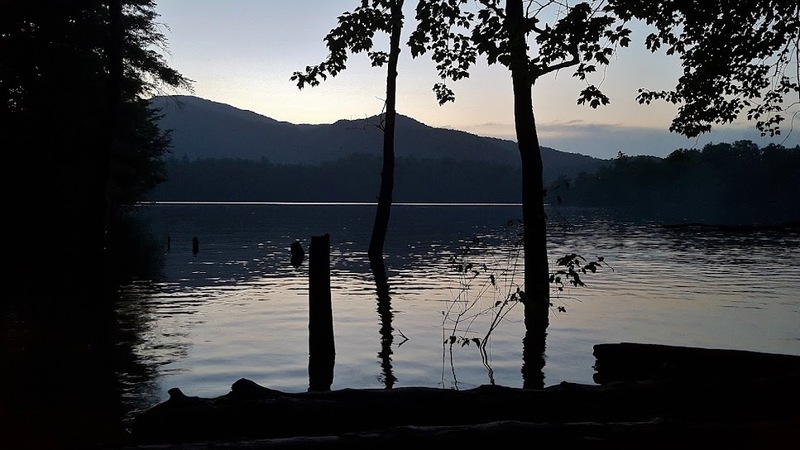 We set up camp at Cheoah Point Campground and watched the last daylight fade over the lake before going to bed. In the morning, we woke up early and headed out. Early morning clouds on Lake Santeetlah were very pretty as we drove around the lake. Past Joyce Kilmer Memorial Forest, we got on Cherohala Skyway. We stopped for a minute here and got some pictures from the Skyway at Santeetlah Gap. Then, we started making our way west into Tennessee. Although it was a mix of sun and clouds when we started, as we headed up in elevation, the clouds got thicker and soon our visibility was next to zero. We didn’t have much of a view from here, but it seemed appropriate to be driving through clouds on the Skyway. After crossing into Tennessee, we drove a short ways to the West Rattlesnake Rock parking area along the Skyway and left one car here. Then we shuttled about 2 miles up the road to Grassy Gap parking area and started our hike from here. A nice patch of black-eyed Susans was blooming right at the edge of the parking lot. We started off on Grassy Branch Trail (#91) to enter Citico Creek Wilderness. Besides a sign at the trailhead, there were no blazes and the trail was rather difficult to follow, making for a good wilderness experience. The trail follows Grassy Branch downstream towards South Fork Citico Creek, crossing the branch several times. Although we were able to avoid wading across, the crossings were a bit tricky. At one point, I slipped and submerged by left foot and had to hike with a wet boot. It rained enough that it probably didn’t make that much of a difference. About half way down the trail, we saw a nice waterfall along Grassy Branch, thought there wasn’t a good spot for a photo. We reached the other end of the trail at the point where the creek flows into South Fork Citico Creek. It was a wet creek crossing, but we made it across and found a trail sign indicating we had reached South Fork Trail (#105). We turned right and followed South Fork Citico Creek upstream. Initially, the trail followed an old railroad grade and was mostly flat and easy to follow. It was a bit of a relief after the overgrown and difficult-to-follow Grassy Branch Trail. The trail continued like this for a half-mile or so and then came to a campsite, where we talked to a couple of fishermen. From here, the trail became narrow and steep and headed up a ridgeline above the creek. When we reached the top, we found an open spot to sit and eat our lunch. After lunch, we continued following the trail, eventually heading down and getting closer to the creek again. There were a couple scenic cascades along the trail, but no good spots to get out and get a good picture. After a while, we had another wet creek crossing and got on Jeffrey Hell Trail (#196) to head back towards the Skyway. Initially, the trail heads up very steeply and it started to rain while we were doing this section. By the time the trail leveled off, the rain had stopped and we followed the trail back to the West Rattlesnake Rock parking area. Before we returned to the cars, however, we wanted to get a waterfall while we were here. So we hiked Falls Branch Trail (#86) to its namesake waterfall. All along the trail here the bee balm was blooming in beautiful shades or red, purple and white. I have some of this flower growing in our front flower bed, but this is the first time I've seen it growing wild. The trail is pretty flat for most of the way, but gets quite steep at the end as it heads down into the Falls Branch gorge. The trail crosses the creek downstream of the falls and then heads back up towards the base. The trail ends at a point a little downstream of the falls where the view is partially obscured by foliage. So I made the very steep climb up to the base of the waterfall. Although it had been cloudy and rainy all day, the sun did manage to come out for a few minutes to ruin my waterfall pictures. I just gave up and headed back. The climb back up out of the gorge was quite strenuous, but the last mile was flat and easy and I enjoyed seeing the bee balm again. Back at the cars, Justine and Bill were going to head to the Cherohala Skyway visitor center, while Sandy and I headed to Bald River Falls. After getting dropped off at Grassy Gap, we drove about another 12 miles on the skyway and then turned onto River Road. There were a lot of kayakers along Tellico River here and the drive was very scenic. It was only a couple miles to the spectacular Bald River Falls, which is visible right from the road. After crossing the bridge, we parked and got out for some pictures of this beautiful waterfall. It’s well known and easy to visit so there were a lot of people here, including some swimming at the base of the falls. Had I not been so sick of being wet all day, I think would have taken a dip. And since there were showers at the campground, I didn’t feel the need to bathe here. 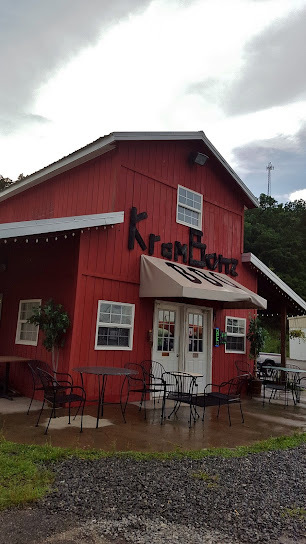 After some pictures, we finished up driving the Skyway in Tellico Plains and had dinner at KramBonz BBQ. After dinner, we drove back on the Cherohala Skyway. We made one stop at the scenic Shute Cove Overlook back in NC. Looking out, we could see low-hanging clouds on the mountains in the Joyce Kilmer Forest area where we could be hiking tomorrow. After some pictures, we headed back to camp, took showers, and built a campfire for the evening. Sunday morning, we broke camp and headed to Joyce Kilmer Memorial Forest. After parking, we did a quick hike along the lower loop of Joyce Kilmer Memorial Loop Trail (#43). The forest is named for the poet Joyce Kilmer who died in combat during World War I. His famous poem “Trees” seemed so appropriate in this beautiful old-growth forest. The trail crosses Little Santeetlah Creek on a footbridge with great views of the creek. Then we headed up to the Joyce Kilmer Memorial at the point where the two loops meet. We then finished up the loop back at Little Santeetlah Creek and got on Naked Ground Trail (#55) to head into the wilderness. 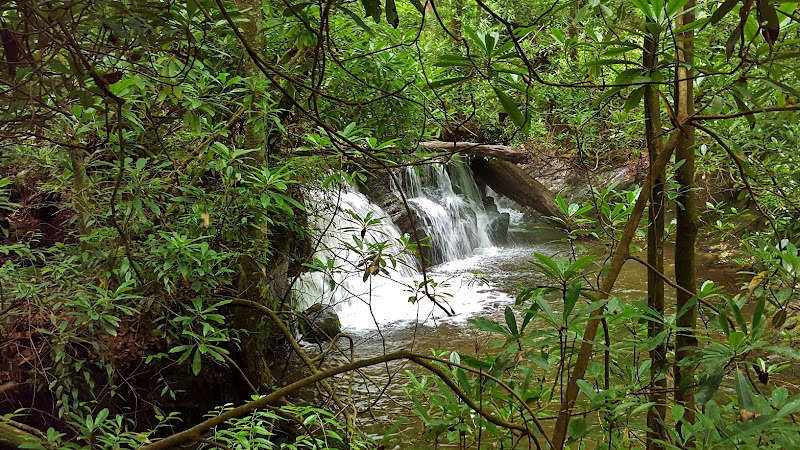 This scenic trail follows Little Santeetlah Creek upstream. The creek is rocky and there were nice cascades along almost the entire thing. In a short ways, we saw a cute little toad along the trail. A little further was a huge rock that looked like a smiley face. We also passed by some enormous trees. One had a cavity large enough for both Sandy and I to fit in. Although there were some steep parts, the trail was mostly gradual for the first 3 miles or so. We also saw some beautiful sulphur shelf fungi, also known as Chicken of the Woods. Although it's probably safe to eat, I don't think I'd ever eat wild mushrooms. Eventually, we reached a camping site and the trail started to head steeply up, departing from the creek. And it sure was steep, gaining over 1000 feet of elevation in a mile or so. When we finally made it to the top, we stopped at another campsite and ate lunch here. A break in the trees provided views of valley below and Lake Santeetlah in the distance. From here, we got on Haoe Lead Trail (#53) and headed east. 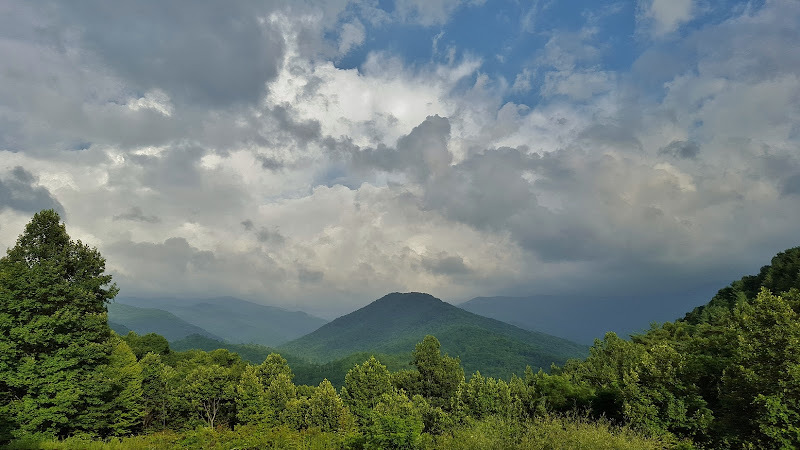 We had planned to take the short spur trail to the Hangover, but it was so cloudy, we didn’t bother as there would have been no views. We continued on Haoe Lead Trail as it steeply headed down the ridgeline. In another mile or so, we got on Jenkins Meadow Trail (#53A). Despite the name, there was no pretty open meadow or views. The trail was incredibly overgrown and difficult to follow. Although the trail descended steeply, the going was slow as we were essentially bushwhacking. I did manage to find some pretty flowers along the trail, though. We finally reached a split where the Connector Trail leads back to Naked Ground Trail near the beginning. We instead opted to finish Jenkins Meadow Trail at the road leading to the Memorial Forest and walking on the road back to the parking area. The hike had taken longer than expected and we had a long drive home, so we immediately departed once back.